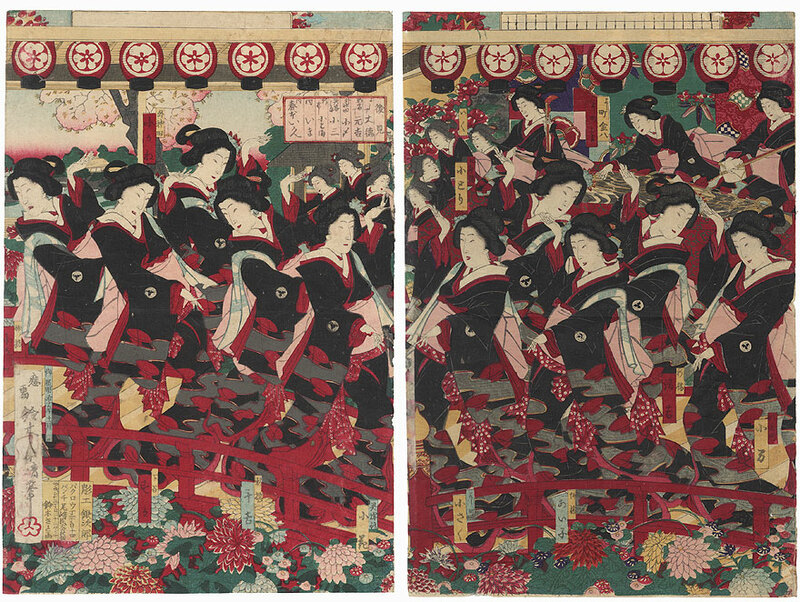 Geisha Dancing, 1883 - Terrific six-panel view of geisha performing a dance, waving their arms in unison as they parade across a bridge with red lacquer railings above a chrysanthemum garden. In the background on either side, musicians accompany them on shamisen, koto, and kokyu, an instrument similar to a shamisen but played upright. Paper lanterns line the eaves, and text panels include the names of some of the beauties. An intriguing subject, rare to fine complete, detailed with faint embossing on the white kimono collars and burnishing on the black kimono. Image Size - 14 1/8" x 56 3/8"
Condition - This print with excellent color and detail as shown. Six separate panels, backed with paper. Losses at edges, wormholes, most repaired. 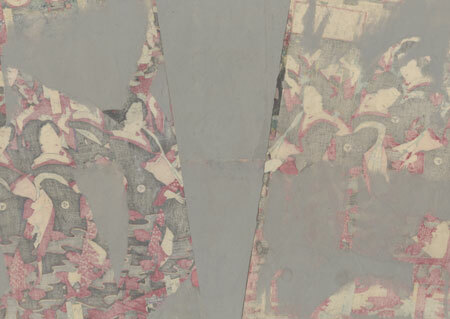 Toning, soiling, a few creases, slight rubbing at edges, paper remnant at side. Please see photos for details.